Everywhere you go in this world you come across strange activities and events that you might not understand but that are really important to the people involved. So, you just stay there, happy to see something different and you grab at the chance to ask some local “What’s going on here?”. And, then, he will proudly tell you about the event, its origin, why they are doing it and so on. Indeed, people are, generally, very proud of their unique customs and Romanians make no exception to this rule. So, you are going to “witness” some of The oldest traditions in Romania, the ones that Romanians are, maybe, most fond of. 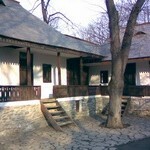 One of Romanians’ most important myths is about the famous old woman called Dochia. She is supposed to be Decebal’s daughter or sister. Decebal was the ruler of the Dacians, the prehistoric people who lived on the territory of present Romania; after these were conquered by the Romans, the Romanian people was born. 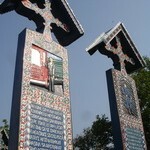 Old Dochia is at the heart of many legends and traditions. One of them says that her son Dragobete, married against her will. So as to punish her daughter-in-law, Dochia sent her to wash some black wool, even if it was a cold winter day. The girl couldn’t succeed in washing the wool and she started crying. Jesus Christ heard her and he came and gave her a red flower. When the girl touched the wool with the flower, the former became all white. When she returned home, the girl told Dochia she was helped by Martisor (she invented a name, as she didn’t recognize Jesus). Dochia was furious as the girl accomplished her task and also because spring had already come. If not, how else could have Martisor given her a flower? Thus, ever since, the colors red and white stand for the coming of spring. 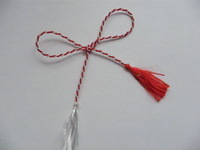 Men give women a red and white string on the 1st of March, tradition saying that those who wear the “Martisor” will be healthy and happy all year long. 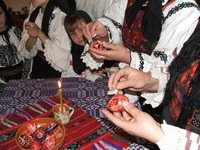 Though the tradition of the red Easter egg is found within many Christian people, it has special meaning for the Romanians. 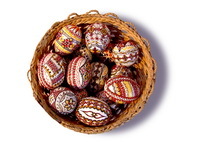 The red eggs symbolize Jesus Christ’s Resurrection and no true Romanian could celebrate Easter without them. On Easter morning, people coming from church (the Easter service usually takes all night long, from Saturday night to Sunday morning) hit two eggs against each other, one person saying “Christ has risen” and the other replying “He has risen indeed”. In many parts of Romania, there are talented people who decorate the eggs with symbols related to life, death, eternity, knowledge or purification. These depend either on the color used or on the line drawn (horizontal, vertical, corrugated and so on). Another tradition says that if you put the red egg in water together with a silver coin and then you wash with this water on Easter morning, you will be healthy, beautiful and lucky the rest of the year. It can also be used by girls, who can give it to the boys they like; also, it is a sign of respect for the married couples to give red eggs to their orthodox wedding sponsors. Of course, The oldest traditions in Romania are too many to cover in one entry; these are just the ones who are still respected by both old and young people. A visit to Romania will surely demonstrate that these are beautiful customs and are worth witnessing.